NES Metal Gear (USA) in 23:33.77 by SprintGod. 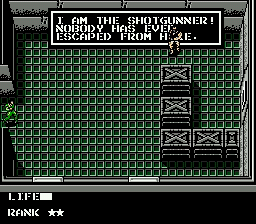 Metal Gear had been one of last of the NES classics that had not been TASed. Well, not anymore ― here's one. This game is infamous for its engrish, having comments such as "I FEEL ASLEEP!" and "UH - OH! THE TRUCK HAVE STARTED TO MOVE!" This movie utilizes quite a wide variety of game glitches and collects the minimal set of items needed to complete the game. The author has written a detailed list of all the interesting bits of this movie.